The teachers and staff at Mapleton Elementary school! Our master builders are the best in the Universe! Because of our MASTER BUILDERS hard work and dedication to excellence, our students are capable of amazing things. It’s the last two Box Tops Stores of the year! Please send clipped, unexpired Box Tops with your student(s) on Friday, April 12th and Friday, May 3rd. They can visit the Box Tops Store at lunch to buy fun treats and prizes. Then remember to clip and save Box Tops all summer long! We are excited for our students to have the opportunity to put down screens, choose healthy treats, and explore the many activities and adventures that await them! Again this year, students will have the opportunity to earn a ticket for every 30 minutes of Active Exercise Adventure Time, a ticket for each day that they go Added Sugar Free, and a ticket for each day they go without Casual Screen Time. Every Student that participates in any of the options during the week will earn a small prize and an extra recess on Friday April 19th! In addition, the class in each age group with the most tickets total will win brand new recess equipment! Mar. 1st: Box Tops Store in the basement at lunch. Mar. 12th: PTA General Membership Meeting, 9:30am. Come vote on the 2019-2020 PTA Board. Bring your dad, brother, grandpa, uncle or any dude! Even moms are welcome! Stop by the book fair and get a new book, bring one from home, or find one in the library to read with your guest. We’ll be in the lower grade library by the front office. 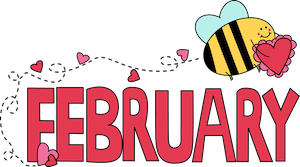 Please note a few things that are going on this month. Jan. 8th: PTA General Membership Meeting, 9:30am in Room #1. All PTA members are invited and children are always welcome. This will be a fun week reminding students to be Drug Free and Media Smart. Students are encouraged to dress up in support of the daily theme. Monday- We’re too bright to harm our mind and body—Wear neon. Tuesday- From head to toe I am drug free and media smart—Crazy hair and sock day. Wednesday- I am a “Jean-ius,” I make good choices—Wear Jeans. Thursday- Team up to keep our minds and bodies healthy—Wear team apparel. Friday- My choices are the key to making my dreams come true—Wear pajamas. To pledge to be media smart and drug-free along with your children! Remember to send clipped and unexpired Box Tops to school with your students on the first Friday of every month. They can use them to purchase prizes and treats during lunch and the school benefits from the money earned from turning in the Box Tops! 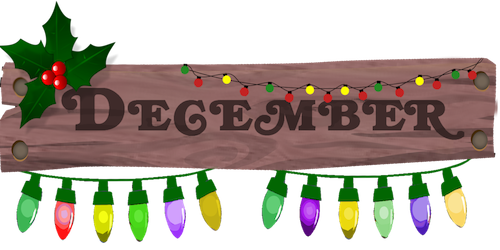 Merry Christmas and Happy New Year from your PTA board! We’re so grateful that we get to work with such amazing parents, students, faculty and staff to help make Mapleton Elementary great! Thank you for all of the time you spend in service of our PTA and school. We hope everyone has a fun and safe holiday break! As you Christmas shop this year, please remember that you can give back to our school! Our school earns a percentage of every Amazon purchase with no extra cost to you. Visit www.mapletonelementarypta.org and click on the Amazon button at the top of the page. You can then bookmark that Amazon page and use your bookmark for all of your future visits to Amazon. Nov. 13th: PTA General Membership Meeting, 9:30 a.m.
Mapleton Elementary has great volunteers and staff who help our children learn and succeed. They go above and beyond what is expected in giving more back to the school and students. Monthly, will recognize a few of them for the good work that they do. Beth Larsen has been volunteering for 3 years in Mrs. Bennett’s class and is still going strong. 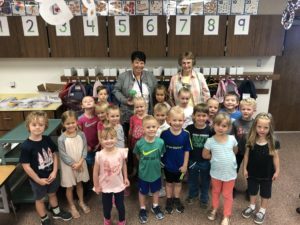 Cornelia Wilson volunteered for 3 years in Mrs. Jensen’s class. 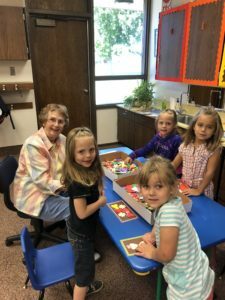 These “grandma helpers” give of their time and love to make a difference for our children. We want to thank them for their outstanding service. Hope Crandall works at the school in the mornings and volunteers in Mrs. Bennett’s class in the afternoon. Mrs. Bennett said, “Hope was there from the beginning when I was hired 4 years ago, just three days before school started. Her granddaughter was in my class and my first call when I got hired was to Hope. 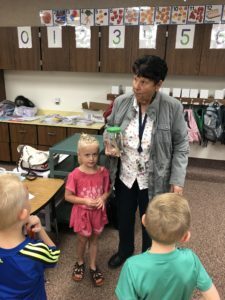 I told her I need a grandma helper and truly I couldn’t have taught that year without her.” She has given hundreds of hours in one-on-one time with students over the last 4 years. Thank you Hope. You are making a great difference for those students that you give so much time to. Volunteers are still needed! Please click HERE to sign up for a shift. Thank you! School shirts will be sent home on October 2nd. Please have your student(s) wear them for National Walk to School Day on Wednesday, October 3rd. All students are encouraged to walk/bike to school that day (if possible) and we even encourage parents to walk with them if you choose. Students who ride the bus will get the chance to walk the perimeter of the playground to emphasize healthy activity and exercise as well. All students will get a snack as they enter the school that morning. During lunch bring your clipped and unexpired box tops to the basement to buy fun prizes and treats! 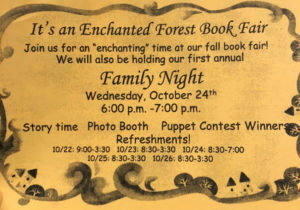 The Enchanted Forest Scholastic Book Fair will be at our school October 22nd-26th. Come with your child(ren) on Wednesday night from 6:00-7:30p.m. for a special Halloween party!